Not a moan but flight (tui) delayed at Manchester. Arrived Barbados almost on time and was transferred to the ship bypassing the airport, (great) arrived quayside as the computer system crashed but was kept up to date with progress and water given out and we were looked after, we were then booked in manually and boarded. 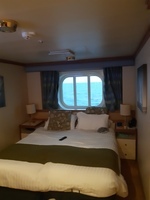 First impression of the ship was very smart, the cabin was an outside with sea view, was small but big enough to sleep in and get changed. Our opinion is we will not be in there all day, it&apos;s only for changing and sleeping, Freddy the cabin boy was brilliant and looked after the room to a high standard, 3 times a day with turn down service. The entertainment team were fab Jo B, Liam, Caroline, Riccy, Ali, DJ Phil Wes and Giovanni were fabulous, kept us entertained. Sea days were a bit packed with sun loungers at a premium, we had to sit on chairs a couple of times, but understandable. The waiter service for drinks was fine though short wait on sea days again understandable with the capacity, yes the decks were chokka at times. The restaurants were very well laid out with the option to share with other guests which was great to meet other people and learn from their past experiences. Food was (as in previous reviews) repetitive but very nice, (i only had the same meal once) the waiters were very obliging and helpful, nothing seemed to much trouble for them. Breakfast in the self service on deck 15 was sometimes a struggle to find a table but most people shared anyway. I had one gripe which was the toast. Was cooked ok but the bread crust was solid i did mention it and was told to ask for fresh as they have someone doing the toast all the time. Drink prices were a bit more than pub price but not extremely over priced, the bar staff were a pleasure to deal with and entertainment of an evening was very good though could have been at times on the bigger theatre as Manhattan bar wasn&apos;t big enough for the better artists. In our opinion the overall state of the ship was not as bad as people say. 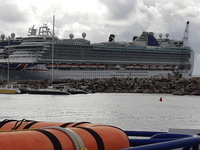 We were very impressed with the ship, the crew, entertainment and food. The itinerary was great with the weather being fabulous with only one Caribbean shower in two weeks. If you want to go ashore just check the Horizon information to see if you need your passport or not and it gives most information you need. arrived quayside as the computer system crashed but was kept up to date with progress and water given out and we were looked after, we were then booked in manually and boarded. Freddy the cabin boy was brilliant and looked after the room to a high standard, 3 times a day with turn down service. The entertainment team were fab Jo B, Liam, Caroline, Riccy, Ali, DJ Phil Wes and Giovanni were fabulous, kept us entertained. Sea days were a bit packed with sun loungers at a premium, we had to sit on chairs a couple of times, but understandable. The waiter service for drinks was fine though short wait on sea days again understandable with the capacity, yes the decks were chokka at times. The restaurants were very well laid out with the option to share with other guests which was great to meet other people and learn from their past experiences. Food was (as in previous reviews) repetitive but very nice, (i only had the same meal once) the waiters were very obliging and helpful, nothing seemed to much trouble for them. Breakfast in the self service on deck 15 was sometimes a struggle to find a table but most people shared anyway. I had one gripe which was the toast. Was cooked ok but the bread crust was solid i did mention it and was told to ask for fresh as they have someone doing the toast all the time. Drink prices were a bit more than pub price but not extremely over priced, the bar staff were a pleasure to deal with and entertainment of an evening was very good though could have been at times on the bigger theatre as Manhattan bar wasn&apos;t big enough for the better artists. In our opinion the overall state of the ship was not as bad as people say. 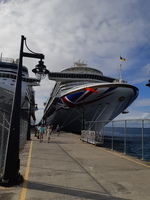 We were very impressed with the ship, the crew, entertainment and food. The itinerary was great with the weather being fabulous with only one Caribbean shower in two weeks. If you want to go ashore just check the Horizon information to see if you need your passport or not and it gives most information you need.